The Academy of Food Marketing was established in 1962 to raise awareness for the enormous career possibilities in the food industry and to support the department of Food Marketing and the Campbell Collection. The only wholly industry-supported program of its kind in the U.S.
As a result, the program is recognized around the world for its quality and for the caliber of its graduates. The undergraduate Food Marketing program at Saint Joseph’s leads to a Bachelor of Science degree. It prepares you for a broad range of exciting careers in the food and allied industries – from managerial positions in food retail, food service, and sales, to advertising, market research, and brand management. In short, the program prepares you to succeed in the classroom as well as in life. When I started my freshman year at St. Joe’s, I was an Undeclared Humanities major; however, I knew I wanted to go into business. During my fall and spring semesters, I decided to take micro and macroeconomics to hopefully gain insight into the Haub School of Business. I really enjoyed the classes and the real world experiences professors used in the classroom. I started exploring on-campus opportunities to get involved in the business school. Mid-spring semester, I attended my first Food Marketing Association (FMA) meeting. This student-run organization allows members of all majors to learn more about the food industry by bringing prominent food companies into SJU. It was there that I began to realize the magnitude of the program and the doors it opens for SJU students locally, nationally and internationally. I learned about the numerous scholarship opportunities SJU offers to food marketing students, along with networking events and the Co-Op program. The Food Marketing Co-Op program allows students to experience three paid, full-time, six-month work experiences before the completion of their degree. It makes students into critical assets within the food industry and allows for professional development at a pivotal point in a young person’s career. I knew it wasn’t an experience I wanted to miss out on. Working throughout high school and freshman year had already taught me the value of leadership experience outside of the classroom and pushed me to submit my application for the program. The day I was accepted into the Food Marketing Co-Op program was not only the beginning of my career, but it was also the beginning of one of the best decisions I ever made. My first co-op experience was in Camden, NJ at Campbell Soup Company. Here, my Community Affairs Co-Op allowed me to fully understand the internal and external philanthropic endeavors of a Fortune 500 company while experiencing corporate America and the collaborative world of consumer packaged goods. I had the opportunity to expedite the integration of a new technology portal and be a project manager for Campbell’s national company-wide week of service. I was able to support and contribute to the decision making of The Campbell Soup Foundation and its ten million dollar signature program, Healthy Communities. I learned and worked in a fast-paced environment with dynamic, cross-functional groups of employees. Having this experience as a sophomore in college can only be attributed to the cultivating nature of the Food Marketing co-op program. My co-op experience empowered me to work with Camden youth through Campbell’s Career Ambassadors program, which aims to introduce the next generation of thinkers to opportunities within the food industry. Every other Thursday I worked with 4th and 5th-grade students in Campbell’s Consumer Test Kitchen in a program called Cooking Matters. 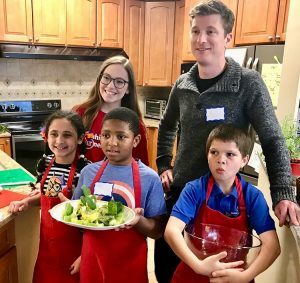 This nutrition education program allowed students to learn about cooking and healthy eating habits. Not only was I able to experience corporate culture during my co-op, but I was also able to live out the Jesuit ideals that I was taught here in our SJU community and implement servant leadership across the Delaware River. Stepping away from the classroom and gaining real-world experience allowed me to build my professional network, develop leadership skills and assert myself as a professional young woman. The Food Marketing department cultivates astounding opportunities and relationships for its students personally and professionally, the co-op program has contributed to the woman I am today. Coming back to academia after my co-op, I have a significant leg up in the classroom. I am able to have educated, experience-driven opinions about the food industry and participate in my classes more actively. Although I’m not sure where my next co-op will take me, I know I will be well prepared and ready to adapt. The Food Marketing Co-Op program has not only given me invaluable industry experience, but it has also made me an industry asset and a more well-rounded student and professional. 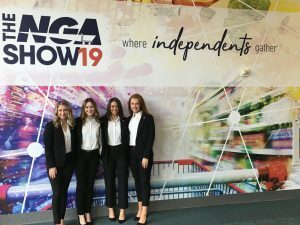 Arlington, VA- The National Grocers Association (NGA) announced Saint Joseph’s University as the winner of the 2019 Student Case Study Competition, held at The NGA Show in San Diego, CA. .
More than 80 students from 13 leading universities with food industry programs competed this year, focusing on the growth of millennials in the workforce and how independent supermarkets can encourage millennial's – especially those from diverse backgrounds – to join the industry. 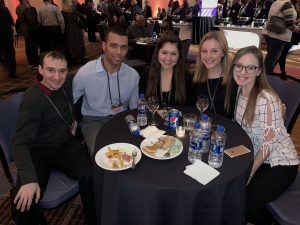 Congratulations to our Saint Joseph's University Food Marketing student team who created history with their win at the NGA collegiate challenge. Our team's Food Marketing faculty coach Professor Latella along with Food Marketing Faculty Dr. John Stanton and Joe Bivona Executive Director of Saint Joseph's University Academy of Food Marketing flew out with our student team to San Diego to compete against 13 schools who were all aiming to take the crown away from Saint Joseph's University. Our Food Marketing team, Alex Marcantonio,Sara Hoffman, Catherine Hoffman and Catherine Geruson who are double majors and all have full time jobs corporate positions upon graduation hung tough over three days of grueling competition. Against tough competition and the pressure to four-peat, this year's team was able able to once again bring the trophy back home to Saint Joseph's University. Our Saint Joseph's University Food Marketing teams now have won the National Grocers Association (NGA) competition 4 big years in a row...that's what history is all about. We're all proud of this year's team!